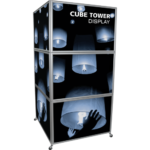 Maximize your messaging in any lobby, entryway, at any event or trade show with the versatile Cube Tower. Available in a variety of configurations and sizes, the Cube Tower is a cube-shaped tower that features easy-to-use snap frames on all four sides, and a toolless assembly. Choose from silver or black snap frame options, and optional wheels or feet for the display. Custom sizes also available. 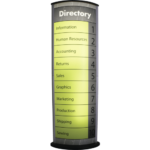 This cost effective, double-sided, free-standing 33″ Backlit Tower features a sturdy construction and stylish design. The graphics are held under tension in a curved, eye-catching bubble position. 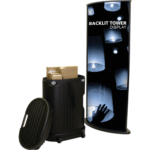 Silver or black side extrusions are available and a backlighting kit is available to turn your tower into a lightbox. 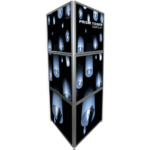 Maximize your messaging in any lobby, entryway, at any event or trade show with the versatile Prism Tower. Available in a variety of configurations and sizes, the Prism Tower is a triangular shaped tower that features easy-to-use snap frames on all three sides, and a toolless assembly. Choose from silver or black snap frame options, and optional wheels or feet for the display. Custom sizes also available. 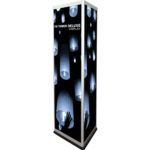 Illuminate your tradeshow booth using our elegant light box display solutions. 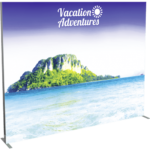 Trade show booth’s with light boxes receive on average 35% more attention than booths with other lighting solutions. Enjoy consistent ROI year after year by illuminating your own booth without having to rely on the hit or miss convention hall lighting. It is no secret that well constructed trade show exhibits attract more people. More attendees at your trade show means more potential business. Being able to backlight your graphics with our lightbox solutions allows these potential clients to clearly see and understand the benefits you are trying to communicate. 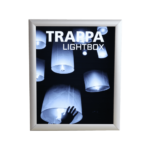 These light box displays come in various shapes – small and large sized light boxes. 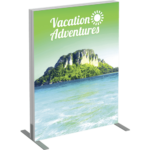 Our Tower display and vector frame options give you full design freedom to optimize your trade show display. 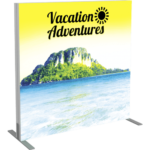 Our line includes vector frame light boxes, tower display light boxes, tower complete light boxes and much more! 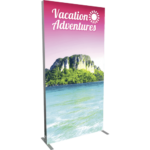 The ease of setting up these display light boxes is what makes them an attractive event option. 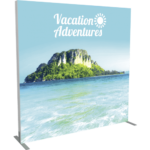 Our Trade show light box solutions are easy to roll out and dissemble, leaving the novice trade show exhibitor at ease. 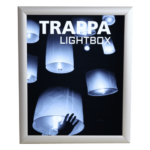 All of our custom light boxes can be made to suit your brand’s needs. All light boxes come with graphic templates that make the design process simple. Your backlit light box display artwork may be emailed to us for our graphic and print designers. They will call you should any concerns arise and all light box displays are handled with the utmost of care. 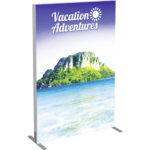 Our light box displays also have the luxury of low shipping costs, making trade show commutes a breeze. 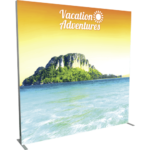 Quality backlit walls, when combined with trade show booth designs can add a distinct element that not only shows professionalism but style as well. Multiple displays can create portable wall shaped designs. Our customer service team can help you with ideas on the best display features we’ve seen in our long years of experience. 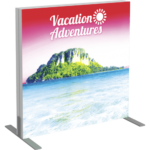 Make the most of it with inexpensive, portable backlit displays today! How durable are your backlit light boxes? Our light boxes generally last for years. We find that most swap graphics out while continuing to use their old hardware. Depending on how the hardware is taken care of, most can hold their own for a very long time. Do you offer Graphic Design services for your light box displays? Generally speaking, we do not offer graphic design for our light box displays. For possible inquiries, please contact our customer service team. For larger light box displays and wall graphics we will offer an hourly rate for any design services needed. 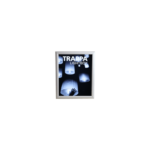 For graphic design templates, please see the product page for the light box you are interested in and download the design specifications. 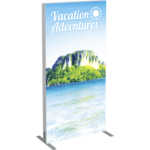 We suggest all light box design files to be at least 300 dpi in resolution for optimal printing resolution.